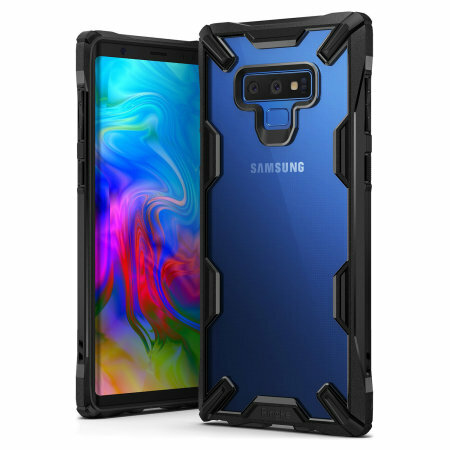 Keep your Samsung Galaxy Note 9 protected from bumps and drops with the Rearth Ringke Fusion X tough case in black. Featuring a 2-part, Polycarbonate design, this case lives up to military drop test standards. Brilliant case very slow postage for royal mail 48 ? Also every unboxing video you see for this case, there is an wrist strap included with the case ? Not sure what mobile fun is getting is it genuine or fake ? As you do have a pic showing strap access design but no strap included! But I must emphasis it’s a genuine case as the build quality is superb feels awesome in hand plus volume up down has this slight curve they feels brilliant to use! case gets 5 stars sorry postage was so slow i have to give it 4 stars sorry mobile fun! Perfect for my Note 9 . This case is good for grip and stylish as well. Love it! Great case and looks sleek too! Case fits like a glove. Doesn't make it that much more bulky either and has pretty good drop protection(already dropped it!) It came away totally unscathed! And that refers to the phone AND the case! It's made of rugged stuff so have no doubt it will survive any more future mishaps!